Details about Hikari Mini Algae Wafers .77oz to 2.2# Want It For Less? LOOK INSIDE AND SAVE! 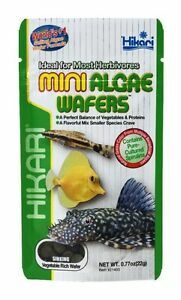 Hikari Mini Algae Wafers .77oz to 2.2# Want It For Less? LOOK INSIDE AND SAVE! Just as described and got here fast. Thank you!. Excellent seller with fast delivery....Thanks Much!